Pig Out® uses sweet fruit, berry and molasses flavors to draw in wild hogs. Pour it over grain or use it straight to create a wallow they’ll frequent daily. Whichever method you choose, your hogs won’t be able to get enough.. 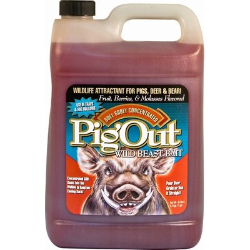 Long-range hog attractant. Distributes potent scents immediately upon application. Generates hog wallows. Habit-forming to keep hogs coming back. Irresistible sweet taste.